Hello, friends! I've been posting a bunch of reviews lately so I thought I would switch it up with a discussion of sorts. So a few days (??) ago Sasha from Abookutopia on Youtube posted something on her snapchat story talking about her new book, Zenith. She started to talk about how she was kind of worried for the negative reviews that she would be seeing about it. She also went on to give examples of constructive criticism as well as just flat out negativity. Long story short, this discussion post was born. Today we'll be discussing not only the importance of constructive criticism but also the difference between constructive criticism and flat out negativity. 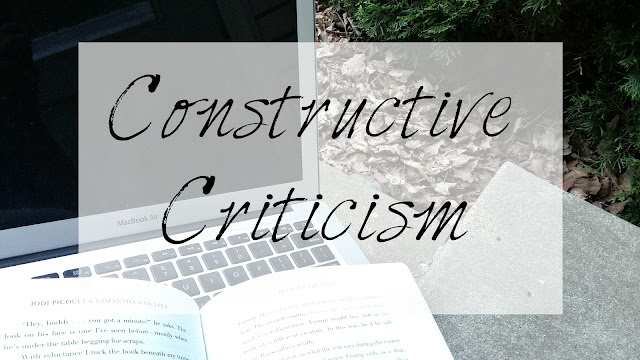 So what is the definition of constructive criticism? Take note of the phrase, "The purpose of 'constructive criticism is to improve the outcome." Notice how constructive criticism doesn't just focus on what you hated about something but rather what you liked and disliked. As well as what could be done to improve. Negativity only includes what was lacking. But why can't I be negative in my review? What if I really did not like the book and there isn't anything positive I have to say? This usually isn't the case. Most people have at least one thing they at least kind of liked in the book. If there isn't something you at least kind of liked about the book then there's probably a reason why you feel that way. You didn't hate the book just because. Was it the characters, the story line, the writing, etc.? Though, just because you give a reason why you didn't like certain aspects of the book doesn't mean that you're giving constructive criticism. "Clouds are fun" by Susie Sue was ABSOLUTELY TERRIBLE. The characters? Trash. The plot? Trash. Don't even get me started on the writing. THIS WOMAN CAN'T WRITE. How did this book even get published?!?! "Clouds are fun" by: Susie Sue was definitely not my favorite. I wasn't too keen on how the characters were portrayed. Their relationships felt slightly forced and I couldn't really connect with any of them. The plot was also pretty confusing. The story felt like it was all over the place and I couldn't keep up with what was happening. I also wasn't a fan of Sue's writing, though I could see why others might find it enjoyable. However, I did like the world the story took place in. It really pulled me in from beginning to end. If you liked Sue's other works then "Clouds are Fun" may be the perfect read for you. It just wasn't for me. In review one I was pretty mean, I flat out insulted Susie Sue by saying she couldn't write. Anyways...as you can see there's a pretty big difference in how I talked about the book. Why is constructive criticism so important? The main reason why I personally believe constructive criticism is so important is because it's just more helpful. For authors and the people who read your reviews. People often turn to reviewers to see if they should purchase a book they're on the fence about and "I HATED EVERYTHING ABOUT THIS BOOK UGHHHHH" is not very helpful. Sometimes authors may come across your review as well. They may take note of what you want to see improve, or they may not. But I think its easier to respect the fact that someone didn't like what you wrote if they give you a reason why in a constructive manner. Do you use constructive criticism? Thanks for reading and have a fabulous day!